When searching for a bottom to a sharp stock market decline like we saw over the past few weeks, one of the necessary ingredients is an extreme level of bearish sentiment, or fear. In some ways, we arguably saw such a condition over the past few days. One example was the spike in hedging, specifically inverse ETF’s, that we noted last week. Another example comes from the term structure of the volatility market. The term structure refers to the various durations of, in this case, the S&P 500 Volatility Indices vs each other. When the near-term indices rise substantially relative to those further out, it can be a sign of trader fear. And when the levels hit extremes, it can be one indication that fear is rampant enough to allow for a stock market bottom, of some magnitude. This was arguably the case late last week. That’s because, as of Wednesday, 10/10, the VIX:VXV (1-month:3-month) ratio had jumped to more than 1.10. 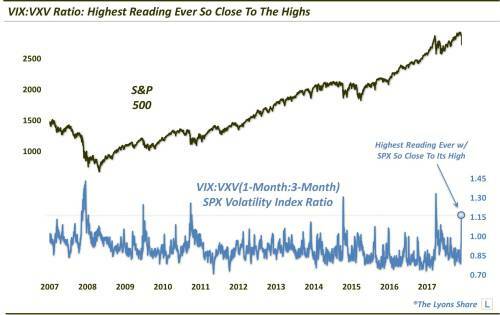 That marked the highest reading in the VXV’s 11-year history on any day that the S&P 500 closed within 5% of a 52-week high. And by the next day, the ratio had jumped to over 1.15 for just the 6th time ever. For the record, the other times the VIX:VXV ratio reached 1.15 were late 2008, the Flash Crash of 2010, the selloffs in August 2011 and 2015 and this past February. Obviously, stocks would be much higher in the longer-term following such incidents. Additionally, besides last Wednesday, there have been 14 other days that saw the VIX:VXV ratio above 1.025 with the SPX less than 5% from its highs. The SPX was higher from 2 weeks to 3 months later after 13 of those days (7/28/2011 was the exception), and higher 6 months later each time. So did fear drive traders to overreact to latest selloff again? And is the market in the clear now? After digging a bit more, it might not be that simple. In a Premium Post at The Lyons Share, we show why, documenting a consistent pattern that may best tell the tale here between volatility behavior and a potential stock market bottom. The SPDR S&P 500 ETF Trust (SPY) fell $0.28 (-0.10%) in premarket trading Thursday. Year-to-date, SPY has gained 5.51%.